If you’re heading down to Pizza Hut for their pizza-like products and breadsticks, you might as well accessorize appropriately. 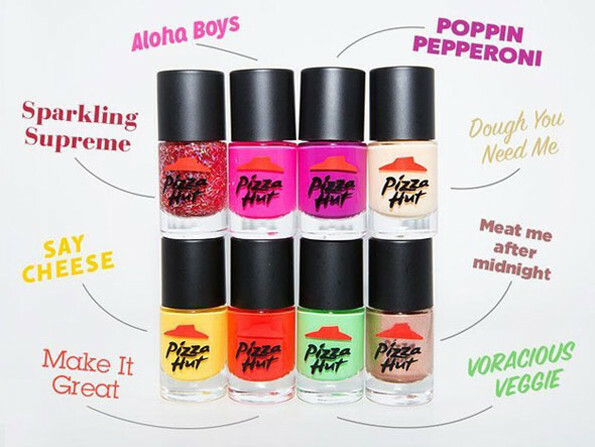 Pizza Hut Nail Polish was recently unleashed in Australia, and they provide the proper pizza hues — with colors such as Poppin Pepperoni, Meat Me After Midnight, and Dough You Need Me. The limited edition nail polish was launched at Pizza Hut Australia as a promotion for their Valentine’s Day poem contest.